A new baby is on the way! InfLens shares your excitement and happiness. It is very natural for many expecting mothers to want to document the life of their tiny bundle of joy from the very beginning and freeze these moments of happiness during pregnancy in the form of pictures. Where your baby bump gets all the attention and everyone focuses on your beautiful body or health, no-one cares about the father-to-be. He's the one who deals with your pregnancy hormones and gets you chocolates at midnight because of your pregnancy food cravings. A maternity photoshoot with your husband is a great idea for you guys to bond as well as have pictures to treasure forever. Maternity photoshoot can be very stressful, specially for the ones who will become parents for the first time. From deciding about what to wear to choosing the location, from what poses to do to choosing the right props, maternity photoshoots can be quite confusing. Don't you worry! This is what we are here for, to help your maternity photoshoot be hassle free and your photographs unique. We have done a total of 100 photoshoots and each of them is different from others. Your maternity pictures will be a memory for lifetime and we will make them worth it. When it comes to having a maternity shoot and that to with your partner, you definitely want it to be unique and fabulous. Here are some poses and ideas that you can use in your shoot. ‘Love’ it's not just a word, it's a feeling. Use your baby bump to be the letter O in the spelling of ‘love’. It is a clever way to show your love for each other. So spell the love out with your bump as a part of the whole act! Let the graphic t-shirts do the thing! Be superheroes or your favourite cartoon characters, your wish. Use printed graphic t-shirts for crazy photos. If you love superheroes than the father and the mother can go for superman and superwoman printed t-shirts, respectively or if you're a fan of Disney than go for a mickey mouse and a minnie mouse printed t-shirt. It's super hard to be parents and if it's your first time than you might as well be reading a lot of books on parenthood to prepare for the new journey. 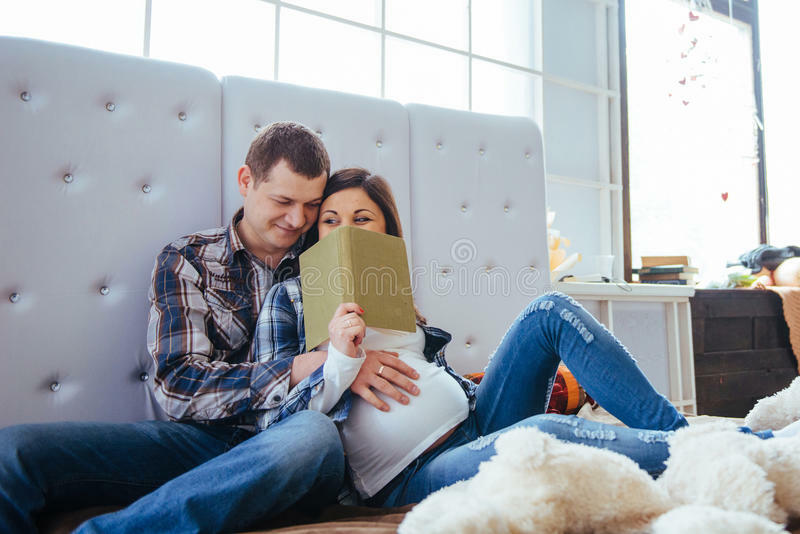 So, grab your books and pose for photos to tell everyone the reality of preparing for parenthood. Everything gets better in black and white! Maternity shoots can be tiring. A photo where you both sit back and relax with a cup of coffee is necessary. Black and white gives a cool and cozy effect. A beautiful background can glam up any basic photo. Include your city's skyline or a historical monument in the background of the photo. Some couples like to read together, some love to travel and some love to watch movies together. What do you guys love to do together? Include your favourite pastime in the photo. Create a romantic setting and enjoy each other's company to get super adorable and mesmerising pictures. You can get your romantic pictures clicked while watching the sunset or while sitting on a bench.